A reflection for the 32nd Sunday, Ordinary Time, year A. The readings are Wisdom 6:12-16, Psalm 63, Thessalonians 4:13-18 and Matthew 25:1-13. When I was at York University, I didn’t live on campus but was part of the (very small) Catholic community there because I didn’t have a parish. I lived about an hour’s bus ride away. One year I was going to help with music for the Good Friday Service. We prepared, picked the songs and practiced. What I failed to realize was that Friday was the first day of the month and in order to get to York, I needed a new monthly bus pass. I walked to the bus and didn’t have the right bus pass and, of course, I had no cash to buy a token (this is way before paying-with-debit days). No problem, go to the bank. But it was a holiday and all the banks were closed. And, of course, when you are looking for a bank machine, you can’t find one. I am not exaggerating when I say that I walked about 10 blocks before I found a bank machine. I got the cash, walked all the way (carrying my heavy guitar case!) back to the bus station, bought the pass and…. holiday bus schedule! There wasn’t a bus every 10 minutes; there was a bus every hour! Needless to say, I arrived at York after the Service had finished. Every time I hear this parable of the 10 bridesmaids, I can’t help but think of all the times I’ve been late for something – although except for that Good Friday, I don’t think I’ve ever missed something because I was late and I certainly don’t think I’ve ever been late because I failed to prepare. In a way I am a bit paranoid about being prepared. I truly believe the saying, ‘those who fail to prepare; prepare to fail’. I am paranoid about doing a presentation or even preaching—if I am not prepared. I’m scared of looking like a fool. And in my work at Salt + Light TV, producing documentaries or TV programs, producing events, there’s no way that we could do it if we didn’t plan. 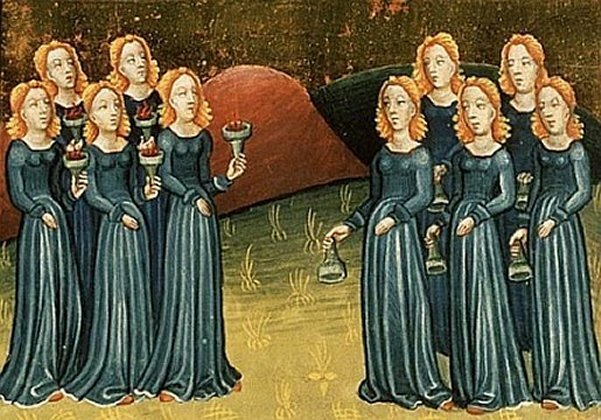 So in a way, I am like the five wise bridesmaids who were prepared. You always have a plan B and a plan C – and a plan D! Just in case. This parable is about preparing but it’s specifically about preparing for the end of times. In fact, for the whole chapter 25 of Matthew’s Gospel, Jesus is speaking about the end of times. And for the whole previous chapter, chapter 24, Jesus is speaking about preparing for the end of times. But He is just speaking to the disciples. He’s not speaking to the Pharisees or scribes. He’s speaking to his followers. This is a message for Christians, for the Church. It’s for us. We all have lamps – we’re here at Church. We’ve been baptised. Apparently, having lamps is not enough. We also need oil! Whatever this “oil” represents, it’s not something that we can just borrow from someone else. you have to go get it yourself; you have to work for it. The wise bridesmaids are not selfish. They just don’t have enough. Think of this procession idea. They have a show to do. It’s better to have a procession with 5 lamps that are working and that will last for the whole procession than with 10 that are not working very well. They just can’t give them oil. What is it in our life that we need in order to be prepared, that we can’t borrow from someone else? God wants to save us. He wants us to go into the Wedding Banquet. But is the wedding banquet even on your radar? Are you like the grasshopper thinking ‘there’s lots of food now; worry about winter later?’ Is your lamp full of faith, hope and love? Are you open to goodness, beauty and truth? Do you live your life in a way that the Spirit of God and God’s Grace can enter into your heart and you can accept God’s salvation? Are you living with the Wisdom of today’s first reading? That Wisdom that says that anyone who wants it can just have it? But you can’t borrow it from someone else. And if you don’t have oil, why not? You know what I think because I’ve said it before. We are not prepared because it’s just not that important to us. We are busy with life. We are busy with all the other more important things we have to do. And we’ve been waiting for Jesus Christ for 2000 years and where is he? He’s not coming any time soon. We’re tired of waiting. That’s why the bridesmaids fall asleep. And guess what? It’s OK to fall asleep —all the bridesmaids fall asleep— as long as you’ve done everything you have to do to prepare, before you fall asleep. This parable is specifically speaking about death and eternal life, and we don’t like to talk about death. But we don’t have to speak about death. How about crisis? Are you ready for crisis in your life? All of us will have crisis in our lives. Some of you have already had crisis. Some of you are in crisis right now. When we get hit by unemployment or financial issues; when there is a death in the family or an illness, having insurance is good, but it’s not the material that is going to be much help to us. It’s our spiritual life that sustains us during those moments of crisis. Are you prepared? You can’t wait until you are in crisis to begin to get prepared. When we’re in crisis we are distracted and confused. We are overwhelmed and we can’t think straight. We need the daily on-going, maintenance of Faith to keep us healthy and ready for the times when faith is hard. The Psalm today is one of my favourite, Psalm 63: My soul is thirsting for you, O Lord, my God. Have you ever been thirsty? I’ve never been so thirsty that I think I’m going to die – that I don’t know where the next drop of dirty water is going to come from. Is your soul thirsting for God? Does your flesh pine for God? Are you like a dry and parched land, lifeless, thirsting for rain? Don’t wait until you are in crisis to thirst for God. Seek Him now, every day, in prayer and adoration. Seek Him in the Scriptures and the Sacraments, the Eucharist and Reconciliation, and doing works of mercy – a bit later on in Matthew’s Chapter 25, Jesus is still speaking about the end of times and He says, “When you saw me hungry, did you feed me? When I was in hospital or in prison, did you visit me?” (Matthew 25:31-46) Are we doing that? All those things fill our lamps with oil.